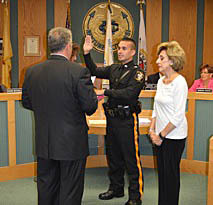 Coaster Photo – James M. VanEtten was sworn in as a police officer in Neptune City this week. James M. VanEtten become a member of the Neptune City Police Department this week after Mayor Robert Brown administered the oath of office to him. With over 150 applications, the department conducted extensive background checks, interviewing approximately 30 applicants that met the criteria qualifications, and then narrowing it down to just three final applications. “You could hire someone for the FBI with the way things are run here,” Brown said. After a thorough interview process, the NCPD and the Council approved the hiring of VanEtten, a lifelong resident of Neptune. VanEtten graduated from Saint Rose High School in June 2009. He received his Bachelors Degree in Criminal Justice with a Minor in Business Studies in 2013. In May 2010, VanEtten graduated from the Monmouth County Police Academy SLEO and worked for the Avon Police Department until December 2013 as a special. In December 2013, VanEtten graduated from the Monmouth County Police Academy Class and was the only recipient of the Traffic Safety and Enforcement Award in SLEO II Class #40. Neptune City Police Director Edward Kirschenbaum thanked the members of surrounding towns police departments including Belmar’s Captain Andrew Huisman and Avon’s Chief Terence Mahon, and Kirschenbaum’s mentor, Chief Jack Carroll. “It’s another great day. I’m happy to see the community here to support the police department,” Brown said.